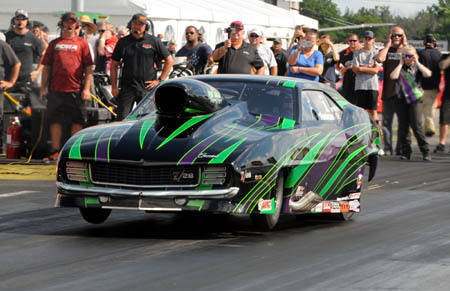 As the reigning, and now back-to-back, Switzer Dynamics Pro Nitrous presented by MoTeC World Champion, Tommy Franklin needs little introduction. 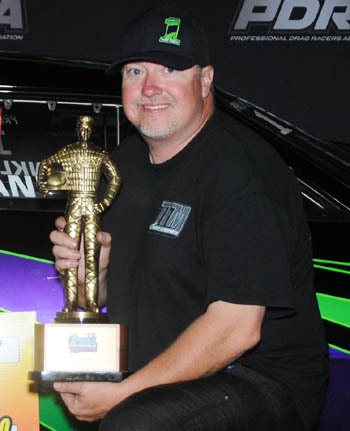 The Virginia businessman has overcome setbacks in his racing career, including an alarming crash in 2008; he's grown not only his racing operation, but also his business ventures in racing; he's held records and is the current elapsed time record holder at a 3.653; and now he sits comfortably atop Pro Nitrous for the second consecutive year. All of these personal and professional accomplishments pale in comparison to one very special event of this year. Franklin shares this championship alongside his oldest daughter, Amber. Amber is the 2017 Campers Inn RV Pro Junior Dragster World Champion. Tommy and Amber are the first father and daughter to share PDRA championships in the same season. And while this is a historical marker to be celebrated, for Tommy, it's the personal joy of sharing these accomplishments with his family that means the most. "I am a blessed man to be able to participate in racing at this level, but to do it at every event with my family just makes it so much more special," Franklin expressed. "There is nothing that makes you more proud as a parent than to see your kids succeed, and for Judy and I we got to watch both of our daughters compete this year alongside of me. Our youngest daughter Ashley came out in her rookie season and finished 5th in points in the PDRA Top Junior category while our oldest daughter Amber won the points championship in PDRA Pro Junior category. The time at the racetrack is a task to keep everyone ready and competing, but there isn't any other way that I would rather have it. I am so proud to watch my kids race and succeed, and this is time that no one will ever be able to take away and I am just thankful to be able to experience it." Franklin had five runner up finishes and a win this season, putting him in all but one final round. He had four number one qualifiers, which helped greatly in securing the Flatout Gaskets Nitrous Wars Championship for Musi Racing Engines. Franklin and his "Jungle Rat" Camaro finished the season just under three rounds ahead of Jay Cox, who won three events this year. Lizzy Musi ran a close third. Randy Weatherford and Jason Harris round out the top five with James Hancock, Johnny Camp, Danny Perry, Jim Laurita, and Ron Muenks following in sixth through tenth. "To be able to pull off a second championship is just unbelievable," added Franklin. "This can't be done without an excellent crew and family as my support system. I really have to thank my crew Chris Murray, Todd Wilcox, Chase Murray, Judy Franklin, Amber Franklin, Ashley Franklin, and all of the friends and family that are always there to support along the way. I have an unbelievable race car built by Jerry Bickel Race Cars and an engine program by Pat Musi Racing Engines. Also want to give a special thanks to Wayne Rogers from Rogers Automotive. Thank you to Switzer Dynamics and MoTec for being class sponsors and also Flatout Gaskets for the Nitrous Wars. There is nothing better than taking that Flatout Gaskets Nitrous Wars Bottle home and either reading the trash talk that has been put on there or maybe adding some to it. Most importantly I just thank God that I have the opportunity to compete at this level with such high level players."